At all the White Horse Hotels, we take pride in the service we offer all our guests. We will help you organise all your travel arrangements to make your stay in Japan as simple and carefree as possible. Just let us know your preferred way to travel when you book with us, and we’ll advise you on the best options. We can organise a direct transfer from Narita Airport to our hotels in Hakuba via a shared taxi service. Your driver will be waiting as you step out of the arrivals area. This option is handy if you are on a late arrival. Travel time is approximately 4.5 hours. Please ask us for more information when you book your stay. Narita airport is one of the busiest airports in the world handling over 35 million passengers per year. It usually takes between 30 – 60 minutes to get through the arrivals area from the time you land. Trains – the quickest and most comfortable way to get to Hakuba is by trains and bus. As you step out of the arrivals area at Narita airport the directions to the train station on the lower levels are well sign-posted. The Narita Express to Tokyo Station departs frequently from the airport station. Travel time is approximately 1 hour to Tokyo station. Look for the green JR ticket box. The customer service agents generally speak English however remember when in Japan, it doesn’t hurt to get the phrasebook out & give it a go if you can, otherwise make sure you speak clearly. Hyperdia is also a good website for information on trains travelling from Narita Airport to Tokyo Station as well as other train travel throughout Japan. JR East 4 day FlexiPass – JR East offers international tourists a range of train passes that allow for multiple trips throughout Japan on their lines. The 4 day FlexiPass is one that can be used for any 4 days during a 30 day period on their long haul lines and as many times on the JR lines in Tokyo for the full 30 days. A good option if you are going to spend a few days in Tokyo before or after your ski trip. Please inquire at the “JTB” office in your home city for tickets then you can validate the pass when you arrive at the Airport train stations and start using it straight away. Otherwise, you can buy once you get to Narita Airport from the JR ticket counter. The bullet train, or “Shinkansen” is synonymous with Japan and we can thoroughly recommend it! The left hand side of the train may reward you an opportunity to view Mt Fuji on a clear day as you travel through Tokyo. Tickets for the Shinkansen can be purchased from Narita Airport when you buy your Tokyo ticket from the JR ticket box. Otherwise you can buy it from the Shinkansen counter at Tokyo station. The Nagano Bullet Train (“Asama Shinkansen”) takes approximately 90 minutes to reach Nagano. When you get off the airport train at Tokyo station, make your way up the escalators to the main concourse then follow the green train sign to the Shinkansen ticket check. It may take you 10-15 minutes to get to the platform from the airport train. If you have 15 minutes to spare head down to the Gransta food court on the lower level of the main concourse to grab yourself one of the hundreds of bento boxes on selection for your trip. If you don’t have time, don’t despair as there is a food cart that proceeds through the carriages with a few treats and drinks. The ride is very comfortable with reclining seats and plenty of storage space at both ends of each carriage for your luggage. There’s a pay phone on the train to call the White Horse and let us know your arrival time so we can pick you up. If you are using a mobile phone, please go between the carriages to talk – the Japanese are very courteous to other passengers and do not use their mobile phones on public transport. If you have arranged a pick-up from Nagano, please let us know your arrival time as soon as possible so we can make sure your driver is waiting for you outside the ticket check stalls to take you to the van. If you prefer to catch the bus from Nagano to Hakuba, turn left after the ticket check stalls and walk about 50 meters and turn left at the bottom of the stairs. From here you will see the bus terminal on the ground level. The Hakuba bus stop is number 6. Please get off the bus at the Happo Bus Terminal. Please call us prior to your arrival so we can ensure our van will be there for when you arrive to take you to your hotel. Train: from Shinjuku Station, you can take the (Super Azusa) Chuo Limited Express. The Super Azusa departs from Shinjuku Station and goes directly to Hakuba Station via Matsumoto. Travel time is about 4 hours and there are some great views along the way. Please check for updated schedules at www.hyperdia.com. We will pick you up from Hakuba train station. 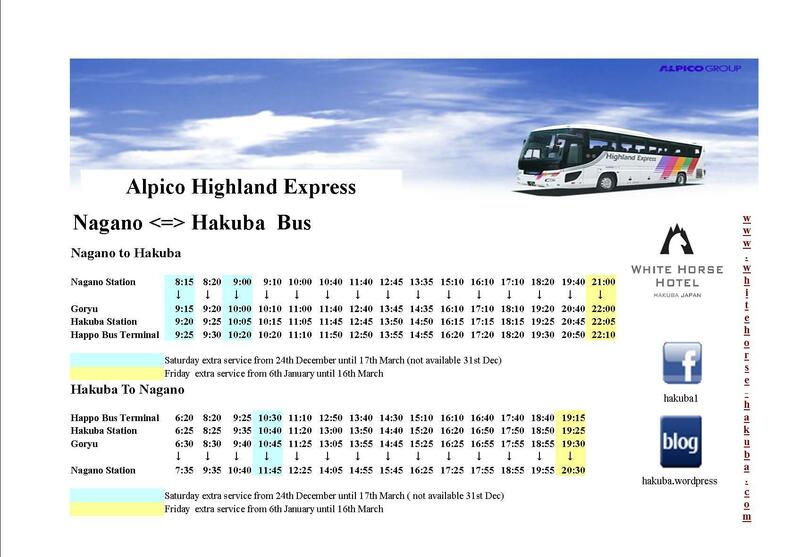 Bus: the cheapest option to get from Tokyo to Hakuba is the bus from Shinjuku. There is also an overnight bus available. We will pick you up at the Happo bus terminal. The Chuo Limited Express (Shinano) departs from Nagoya Station and travels via Masumoto to Hakuba. We will pick you up from Hakuba Train station. A shared taxi service is also available from Nagoya airport direct to your hotel in Hakuba. Please ask us for more information. If you are coming from Osaka or Kyoto, catch the “Sanya Shinkansen” to Nagoya then transfer to The Chuo Limited Express (Shinano) from Nagoya direct to Hakuba. Travel time is about 4hrs 30min. Car hire can be arranged from all major airports in Japan and also from Nagano train station. A hire car is a great idea if you want to get around Nagano freely and try some of the ski resorts a little further away, like Shiga Kogen and Nozawa Onsen. The navigation systems make getting around quite easy. Snow tyres and 4WD are a must in Hakuba during the snow season. An International Drivers License is required to drive in Japan. Please ask us for more information. Tokyo is an amazing city with lots to do. Why not tack a few days onto your holidays before or after you ski trip to savour some of what it has to offer. We can recommend a number of hotels in Tokyo to suit all budgets & styles. Please ask us when you book your stay. Hello we will prob be flying Quantas and flying into henada airport – how do we get to Hukuba form that airport ?